How would you like to receive this beautiful dog lover bracelet without spending a penny? For Love of a Dog is a proud sponsor of the Doggies and Stuff Holiday Gift Guide's Giveaway-A-Day. Celebrate your heart dog in style with this one of a kind handmade dog lover bracelet. 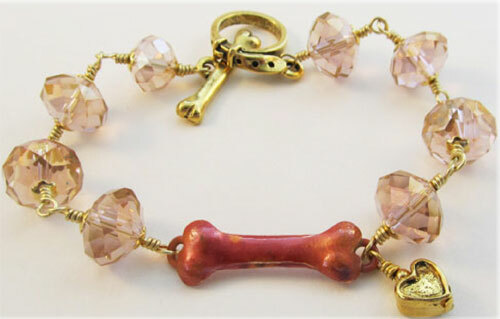 Beautiful flamed, hand crafted copper dog bone focal is accented with gorgeous rose pink crystal rondelles. 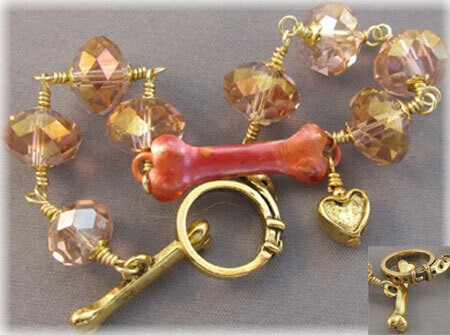 Check out that adorable gold dog collar and dog bone toggle clasp! Of course, there's a sweet gold heart dangle, too. Fetch Doggies and Stuff to enter now! You have until December 23, 2012 to enter. There are lots of chances to win. Good luck!